As a blogger it is almost impossible to rank for every blog post you write, especially if you publish article daily. This makes it very important to have a SEO plan for the posts you want to rank for in search engines. Building your search engine traffic is very important if you are to achieve a long term passive income from your blog. Having a SEO plan for such blog posts is very important because the things to do can be easily forgotten when you are constantly under pressure to put out posts daily. 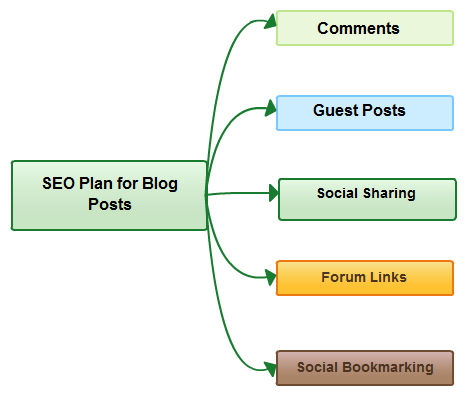 Below is the SEO plan I use for most of my blogs, your can be different but the most important things is to have a plan. You can use a free mind mapping software like Creately to draw them. You saw my plan and now I will tell you how to I implement it. I usually start with social sharing because having social credibility in the post makes it easier to get back links. Also studies have shown that social sharing signals help in Google rankings. Here is one such study that that shows the effect of tweets on ranking. This also gets the initial traffic in and get some viral traffic. And if some like minded blogger sees your post then you have good chance of getting a back link as well. The next step is the social bookmarking part. Which includes Stumbling the article, sharing it on Digg,Reddit, BlogEngage etc. This helps in getting some additional traffic and if they took off in one of these sites then you have a huge chance of getting multiple back links as well. Also sites like Stumbleupon are good sources of long term traffic. Next step is the blog commenting. Even though not shown here I divide it to three more sections. Commentluv blog comments, normal blog comments, high profile blog comments. CommentLuv blog comments are a good way to get some back links without much effort. This helps the post get indexed quickly in Google as well. Normal blog comments are similar blog posts that discuss your topic. Don’t worry too much about do follow tag, whether they have it not as long as they are relevant they help in ranking. Finally it’s time to look at some edu and gov blogs and see if you can leave a link with a comment. This is generally harder to do but worth the effort. 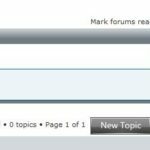 Forum links are self explanatory, I mostly do this for some additional traffic and link diversity. The final thing is to add some guest posts linking back to the original post. I only do 3-4 guest posts per article but if its a hard but a profitable keyword I might do more. It is also worth noticing that guest posts build your brand image. A combination of all those things mentioned above will definitely help you to rank for most of the keywords you are chasing. I'm a software engineer turned tech evangelist. I currently work with Cinergix, who produce Creately diagram software which you can use to draw flowcharts and many other diagram types. I work with start-ups and small businesses to promote their products. I have over 5 year experience in Internet marketing and use them to good use when working with clients. Visit my blog mentioned below to learn some of those methods. SEO plan is necessary but implementation is equally important. I still doubt the link juice given by commentluv blogs since most of them are full with comments. But you have also mentioned commenting on normal blogs. Perhaps, I should plan a strategy for my blog for my struggling blog. well its very important to every blogger to plan seo as its important to get organic traffic. thanks for informative post.